The Sensational Butterflies exhibition offers visitors a taste of the tropics and its native butterflies. Butterfly House Manager Luke Brown tells us what it takes to keep the hundreds of butterflies soaring. The exhibition hosts over 500 butterflies from several countries around the world under one roof - so it's no surprise that it takes more than a little planning to prepare and maintain the butterfly house for its winged residents. Because butterflies are exceptionally sensitive to changes in their environment, building a house for them is a delicate task. Conditions have to be just right to keep these fragile animals happy and flying at their best. With average temperatures of 27 degrees Celsius by day and 18 degrees at night, and at 100% humidity, the butterfly house is truly home to the many tropical species inside. 'The idea is to get the environment in the house as close to the butterflies' natural environment as possible,' says Luke. Some butterflies are fussier than others when it comes to food, so the butterfly house is equipped with a variety of plants and alternatives to ensure that every species is catered for. The team - Luke, his colleagues Kerry and Pablo, and a team of volunteers - plant an abundance of flowering plants for the butterflies that feed on nectar. 'The most important nectar plant we keep is Pentas. It flowers pretty much throughout the summer season if it's looked after well, and it produces nectar quite quickly,' says Luke. Also popular with the nectar feeders is the Lantana, while Verbena bonariensis is provided for more selective species such as the plain tiger (Danaus chrysippus). Not all butterflies feed solely on nectar. Some prefer fruit that has fermented in the heat of the house. A table of fruit is set daily and owl butterflies (Caligo species) are often seen there guzzling juice for most of the day. Strelitzia and banana plants are key food sources for some caterpillars in the house. Owl butterflies that breed in the house lay their eggs on these plants. The particularly picky Heliconius species - commonly known as the tiger longwing, zebra longwing and postman butterfly - lay their eggs exclusively on passion flower (Passiflora) vines. Once hatched, the caterpillars feed voraciously on the leaves. Some plants in the house are there for purposes other than food. Big trees such as the pygmy date palm and the lady palm (Phoenix roebelenii and Rhapis) give visitors a real feel for the tropical forest that the butterflies inhabit in the wild. Visitors can also find fruit trees such as guava, mango and star fruit among the undergrowth, as well as coffee plants. None of the butterflies featured in the exhibition are taken from the wild. Luke works with a supplier who sources them from farms in Central America, South America, Africa and Asia that breed the butterflies under strictly controlled conditions and sell the pupae, also known as chrysalises. These farms offer a sustainable way for nearby residents to make a living. The farms also help preserve the local wildlife because they provide an alternative to palm oil plantation farming, which often destroys native forest habitats. A number of the butterflies that are bred on these farms are released into the wild, helping to boost populations, as they can't be transported over long distances once they are past the pupae phase. The farmers make sure the butterflies are free of disease before releasing them. 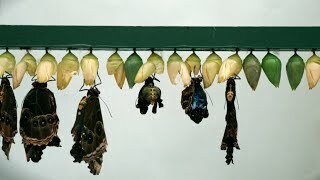 Butterflies that are in the pupae phase are easiest to transport because they don't need to feed. Shipping the pupae requires exact timing to ensure none of the butterflies emerge in transit. New pupae are brought in throughout the course of the exhibition, starting with 1,000 per week and reducing to around 300 per week once the house's adult butterflies begin to breed. Luke adjusts the number of incoming pupae to make sure there is always more than enough food for all the caterpillars and butterflies that emerge. He aims to fill the house to 75% of its capacity. For the first two weeks after the house is built, adult butterflies also arrive from other UK butterfly houses. They are transported early in the morning, during their rest phase, to not disrupt their daily pattern of feeding. When the exhibition ends, all the live animals - including adult butterflies, caterpillars, pupae and eggs - will be rehomed at other UK butterfly houses. The butterflies are again transported while they're resting. You may spot pupae hanging from plants in the exhibition, like this one. A caterpillar crawled along the branch before changing into a chrysalis. In the wild only around 2-3% of laid eggs eventually become butterflies. However, in the Museum's butterfly house this number increases to around 70-80%, thanks to Luke and his team assisting the butterflies where they can. 'We're almost like midwives to them,' says Luke. 'It's not uncommon for a wing to get stuck in the pupa casing while the butterfly is emerging. In the wild the butterfly would die. Some species need more of a helping hand than others. The tree nymph has a hard time emerging if the humidity is too low, so special monitoring is required in case they need assistance. One species that appears to have no trouble emerging by itself is the blue morpho. 'Blue morphos are bulletproof. They have a 99.9% success rate,' says Luke. Butterflies may be small for the most part, but keeping them happy takes a lot of work. 'People often say that a butterfly exhibition in a zoo or wildlife park is one of the most time-consuming to run,' says Luke. 'I'm not saying it's easy to keep elephants, lions and tigers,' he explains, 'but those need very little attention throughout the day. A day in the Museum's butterfly house starts two hours before the exhibition opens. The team spend a large portion of that time watering the foliage. Other daily tasks include removing dead flowers, preparing fruit, clearing the puparium of butterflies that have emerged and checking for disease and pests. The team also ensure none of the butterflies escape into the wild. Although they would not likely survive long in such a different climate, it is important that exotic species are not introduced into the wild in Britain. Measures are put in place to avoid any major breakouts. The house features two sets of special doors and a plant border runs along the entire outside length. 'Although it may look like an aesthetic gardening choice, the flowers serve as the largest source of nectar in a three- to four- mile radius,' says Luke. A blue morpho rests on a visitor's bag. Check yours for passengers before you leave the house. Butterflies in the house often spend time on the ground, drinking from the moisture. Although it's possible to get close to them, the vibration from a foot hitting the ground tends to make a butterfly move. While it's exceptionally rare to step on a butterfly, it's more likely to damage one by touching it. The wings are very fragile and can dislocate or break if handled incorrectly. Furthermore, a butterfly's taste receptors are in its feet. 'If you force your hand under a butterfly's feet to make it crawl onto your hand, it's like shoving a load of perfume onto someone's tongue,' explains Luke. However, some species will land on people voluntarily, to feed from their sweat. If a butterfly needs to be moved for its safety, the team know how to move it by the wings without causing damage. Luke has run the Museum's tropical butterfly house since it first opened in 2008. He also consults on butterfly houses around the world. But his enthusiasm for butterflies goes back much further. 'Butterflies have been my passion since my sixth birthday, when I visited a butterfly house for the first time and was absolutely spellbound,' he says. 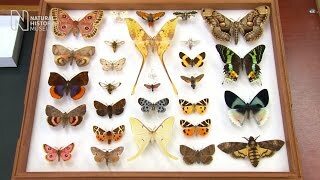 'I hope children and adults visiting the exhibition at the Museum will experience a similar thrill, and leave having discovered something new about butterflies and their habitat. It looks like bird droppings on a leaf, but don't be fooled: it's a caterpillar in disguise.